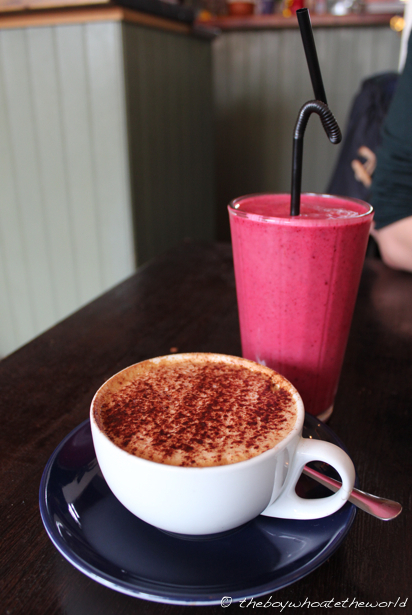 What makes a great neighbourhood cafe for you? For me, it’s a place which dishes up food that’s hearty yet comforting. It’s run by proprietors that are friendly and warm… who go thru even the most hectic of lunch services with nothing but a smile on their faces. And it has to have that laid back ambience… one that allows you to wind down and let everything go. And if there’s one hidden gem I’ve stumbled upon in a quaint little corner of Hackney that checks all these boxes, and a little more, it’s Little Georgia. With plenty of natural light streaming in through their oversized windows, old-school gramophones lining their shelves and black & white portraits from another era, it was a rustic yet charming setting for our first ever foray into Georgian food. 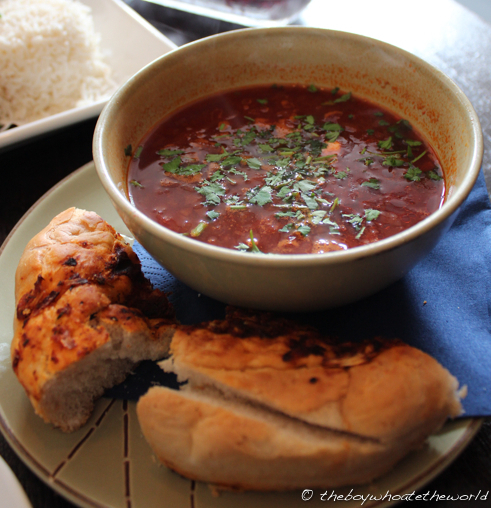 Their Borscht, served heartwarmingly hot with a crusty roll of bread was an absolute joy. The rich stock, spiked with loads of pepper and paprika had a great depth of flavour, bursting with the flavour of beetroot-y goodness, fresh herbs and sour cream. It’s a dish that’s the acid test of any Eastern European eatery, and my oh my did this one knock it out of the park. 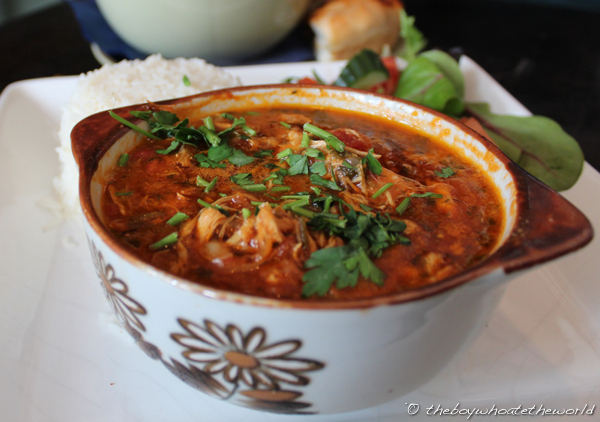 Georgian Chicken Stew, a daily blackboard special was akin to a mild, tomato based curry. Full of spices and fresh herbs, it was delightfully light, with a fruitiness to it almost. The chicken was also wonderfully tender, falling off the bone from hours of slow-cooking. The sort of rustic, home-cooked food that’s soul-enriching. 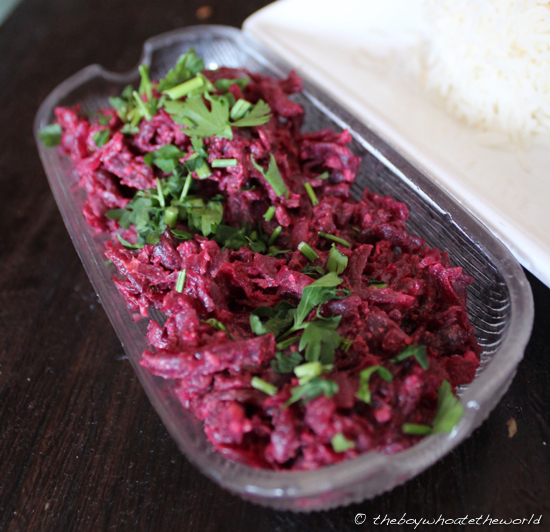 Best of all though was their Beetroot salad… a superstar of a side-dish. The natural sweetness of the velvety soft beets was complemented perfectly by a creamy well-seasoned dressing. In fact, just the sight of the juxtaposing colours of beets and flat-leaf parsley alone is enough to send one into a hypnotic salivation fit. Give me a plain piece of white toast with this side-dish any day and I would be a properly happy bunny. What was originally meant to be a quick, light bite for lunch was slowly turning into a Georgian feast. And with the Borscht and Chicken stew exceeding all expectations, we felt it would be a crime to pass on their Georgian Pancakes. With a slightly puffed, almost crossaint-like texture, it was serious comfort food, especially with the generous helping of fruit on the side. 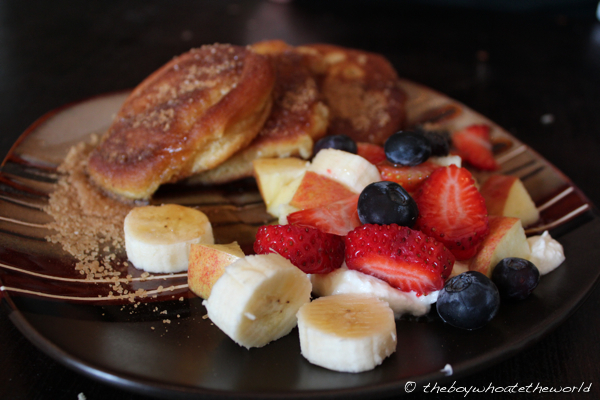 I did find the dish overly sweet though given the over-zealous sprinkling of brown sugar and cinnamon on the pancakes. With the bill coming up to just under £25 for the 2 of us, it turns out you can feast like a Georgian King without breaking the bank. And in spite of the overeating, it all felt like healthy, hearty, home-made food. All in all, we couldn’t have asked for a better way to ease into a sunny Sunday afternoon. 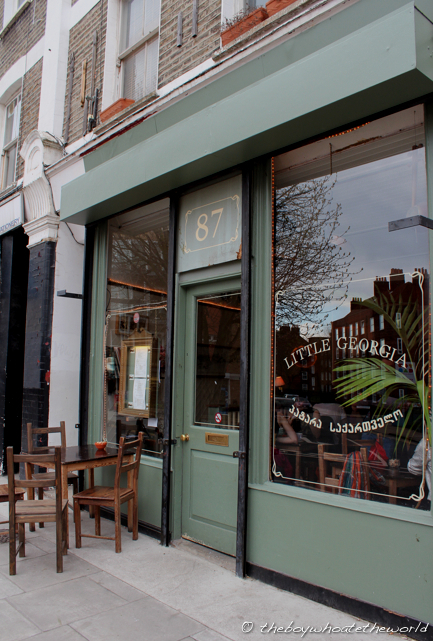 A highly recommended gem, and a more than worthy pit-stop if you are ever in the area visiting nearby Columbia Road Flower Market or Hackney City farm. ← Hawksmoor Spitalfields Bar: Cocktails with Lobster Rolls and Shortrib Nuggets anyone? I’ve still not tried Georgian food and I really should! Does this place serve kachapuri, that famous cheese bread?